I keep a fair number of files on my desktop but there’s so much room between them that it doesn’t take long before they overlap one another. Is there anything I can do to squeeze in these icons a little tighter? Yes. Your solution is a breezy Command-J away. Just click on the desktop, press this helpful keyboard shortcut, and a Desktop window will appear. It’s within this window that you can change the size of your desktop icons and—perhaps more importantly in your situation—the size of the desktop grid. I’ve found that an icon size of 32 x 32 is large enough that I can discern what an icon is as well as select it with little trouble. I then play with the Grid Spacing slider so that I can see each item’s full file name (squish down the grid too far and you see ellipses in file names). The default text size of 12 is fine for me, but if you find the text a little small, feel free to bump up the text size. 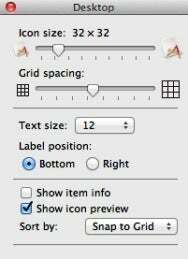 As a long-time Mac user, the idea of the label position on the right side gives me a bad case of the jim-jams, but that too is an option. Likewise, enabling Show Item Info (which, in the case of desktop items means you see the number of items in a folder and the amount of free space on a hard drive or volume) is unnatural to me. Before we leave the subject, allow me to remind you that placing a lot of items on the desktop can slow down your Mac because the Mac treats any items with custom icons as windows that it must draw. Drop 40 or more files on your desktop and you’ll find that performance declines. Better to file away these items in their proper place.